NASA is providing live coverage of the return to Earth of SpaceX’s Crew Dragon after five days docked to the International Space Station. Known as Demo-1, SpaceX’s inaugural mission with NASA’s Commercial Crew Program is an important uncrewed end-to-end flight test of the new system’s capabilities. The spacecraft departed the space station at 2:32 a.m. EST and is on track for a splashdown in the Atlantic Ocean about 200 nautical miles off the eastern shore of Florida. 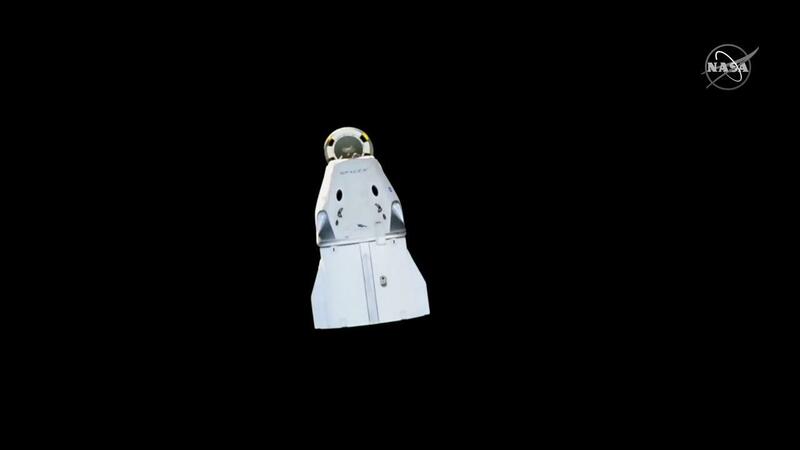 At approximately 7:48 a.m., Crew Dragon will separate from its trunk containing its solar array and radiator. Four minutes later, the spacecraft’s thrusters will initiate the deorbit burn at 7:52 a.m. The 15-minute, 25-second burn will place the Crew Dragon on its final re-entry path into Earth’s atmosphere. The nosecone will be closed before the spacecraft enters the atmosphere. At about 8:41 a.m., drogue parachutes will deploy, and the four main chutes will begin to open less than a minute later to slow the Crew Dragon during its final descent prior to its water landing at about 8:45 a.m.
SpaceX’s two recovery ships are positioned nearby to recover Crew Dragon and return it to Cape Canaveral Air Force Station, Florida, to conclude its mission.